By Steve Kaufman. DVD/Instructional/Folk Instrmt. Instruction, Bluegrass. DVD. With guitar tablature. Homespun #DVDKAUGT21. Published by Homespun (HL.641655). ISBN 1932537538. 5.25x7.5 inches. 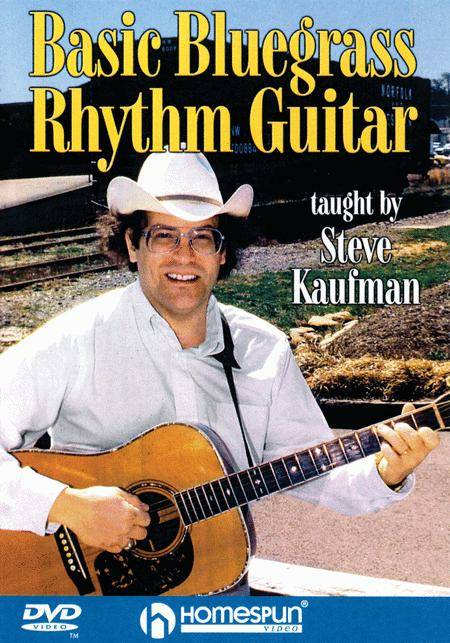 Taught by Steve Kaufman. 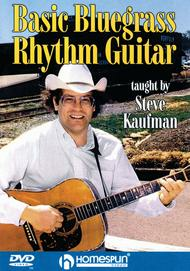 Steve Kaufman is one of America's top bluegrass guitarists. His video covers the basics of back-up guitar, from the simplest two-chord song to Texas-style fiddle tunes. Players will master bass walks, the Lester Flatt “G run,” altered chords, complex progressions and more. Steve provides valuable insider's tips and gives the techniques and practice sessions needed to play solid back-up in any picking situation. Songs: Wabash Cannonball • Blackberry Blossom • Sally Goodin. 70-MIN. DVD • INCLUDES MUSIC + TAB • LEVEL 1-2.